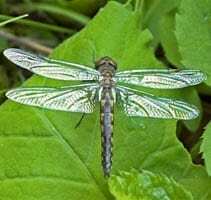 The common baskettail is a dragonfly of the Corduliidae family. The thorax is brown and hairy. Some specimens have a triangular spot at the base of the hindwing. Individuals are difficult to distinguish from the other species in this genus.